Noticing the proximity of the Mayan Ruins abutments to Camp Mills Base Hospital, I couldn’t resist to create an overlay using the 1926 aerial Cheryl Lynn Blum submitted. 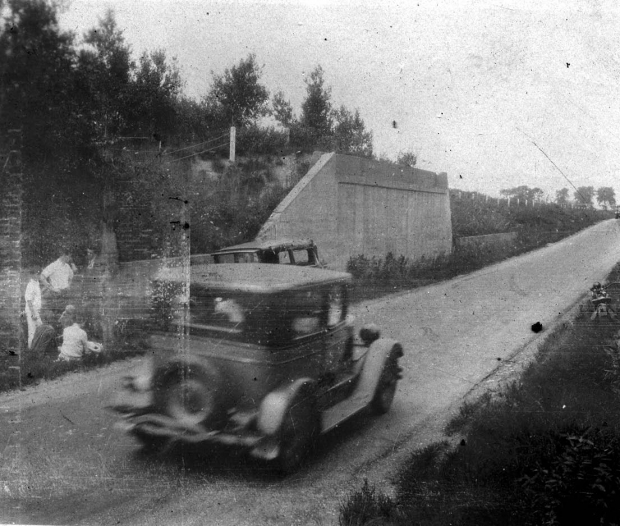 Hospital Road, once running adjacent to the Motor Parkway, terminated right at the foot of the never-built bridge. The aerial also reveals how many walked through dirt paths to cross the parkway at the southern end of the abutments. 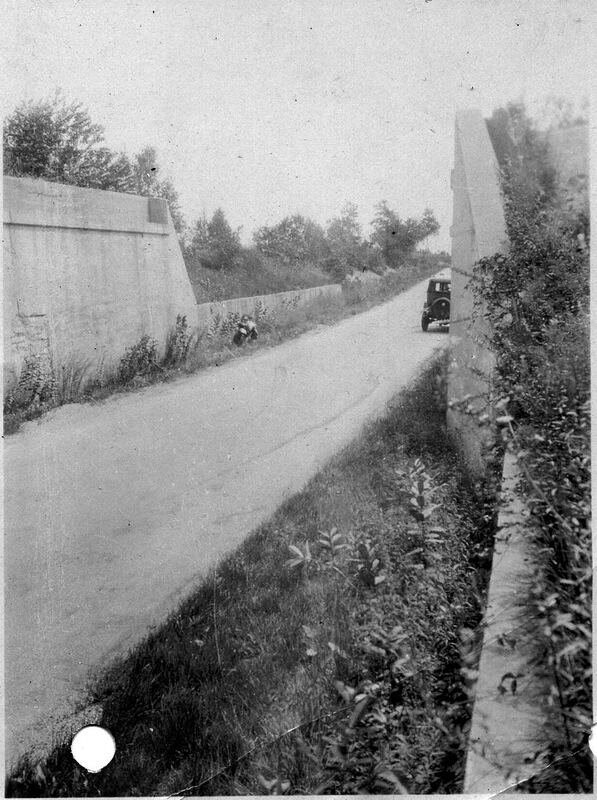 And though barely visible in the photograph, I can still faintly read the year 1913 or 1917 on the abutment sign. Could it be the bridge was never built because of the hospital’s short life span 1918-1919? a The statements of fact appearing herein are based on the "History, Base Hospital, Camp Mills, Long Island," by Lieut. Col. A. W. Cutler, M. C., U.S.A., while on duty as a member of the staff of that hospital. The material used by him in the compilation of the history comprised official reports from the various divisions of the hospital. The history is on file in the Historical Division, Surgeon General's Office, Washington, D. C.-Ed. Statistical data, United States Army Base Hospital, Camp Mills, Mineola Long Island, N. Y., from April 6, 1918, to September 18, 1919, inclusive. 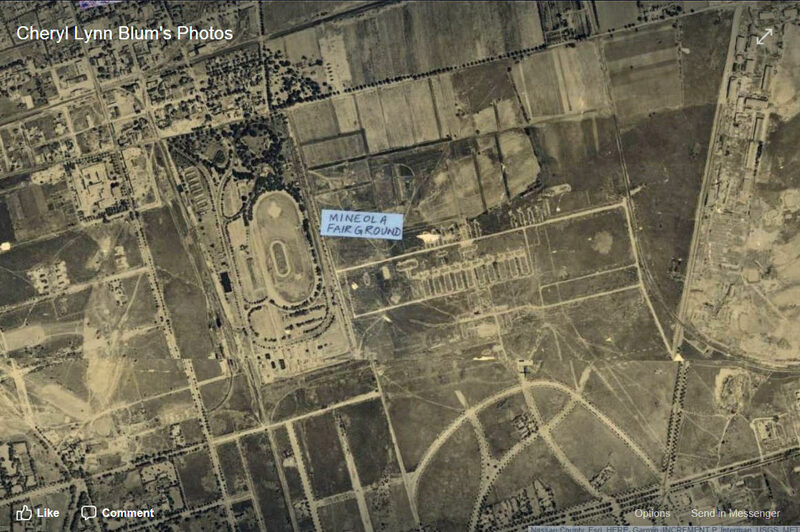 1926 Garden City aerial submitted by Cheryl Lynn Blum. This theory has been in the back of my mind ever since Howard was wondering, and now Frank. I can definitely envision a proposed road angling from the NE, following the unfinished bridge; and merging with Transverse Rd. Wish I could make out the years that you see, Frank; on the sign/plaque that’s mounted on the west abutment. Year 1917 would be the right time period. Your mapping is excellent as usual, Frank. Remember Mr. Bellmer stating that Transverse Rd. was carved out specifically for the Base Hospital ( presumably Hospital Rd. as well ). You have access from Washington Ave., and I’m guessing that Hospital Rd. connected with Clinton Rd. or Stewart Ave.
Wow Frank. I’m impressed. Your cartography skills are amazing. Nice Job it makes perfect sense that bridge would have serviced the hospital from the airport at Mitchel Field . Driving my bicycle last week near Mayan Ruins noticed two new houses on corner of Transverse and Russell Rd, Garden City. The house where the Mayan Ruins stood has been knocked down. In its place there are two new houses. The contractors must have knocked down the west side the old concrete embankment of the Mayan Ruins. Howard, could the Mayan Ruins be the start of a railroad-type trestle bridge? I note the abutment walls, the width of the cross-section, and the alignment of the right-of-way fence posts, all suggestive of that bridge type to me, but others might know better. A trestle bridge in an area where no roads or paths had previously existed in USGS maps as far back as the 1890s would be consistent to an Army/Camp Mills link.